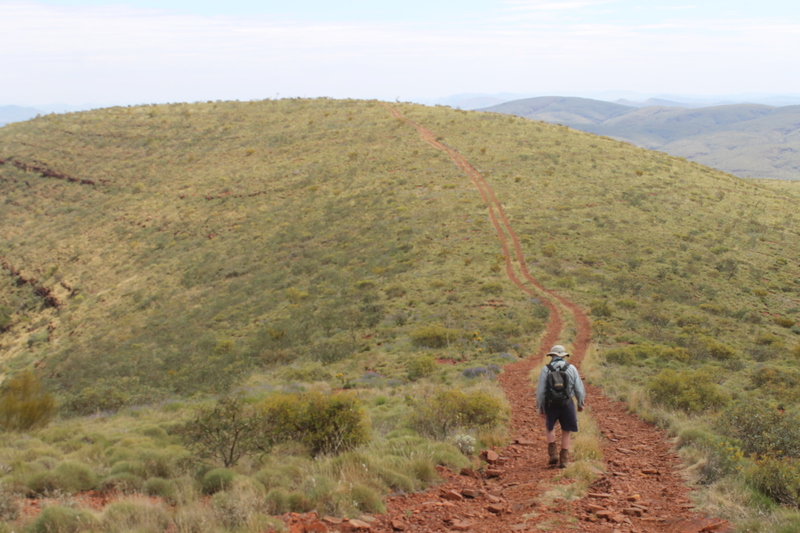 To climb Mt Meharry in Western Australia’s Pilbara region is easy enough. 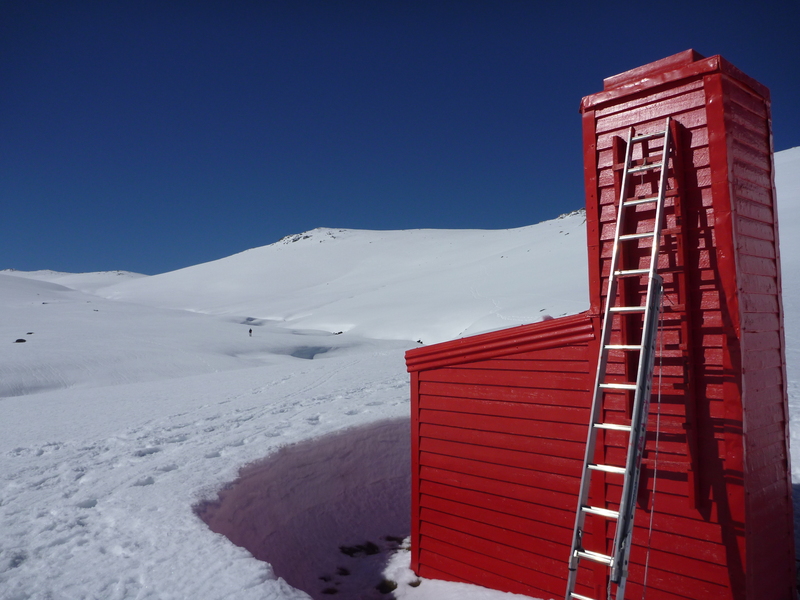 A ramble of 11 kilometres will take you to its 1253 metre summit and back. 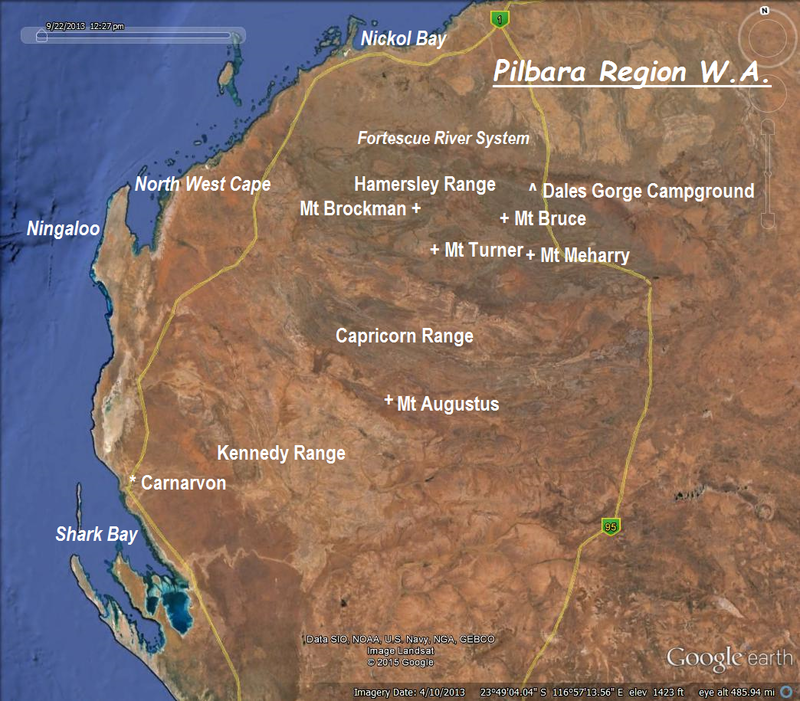 A mere day walk for local Pilbara peakbaggers. But for this party of blow-ins from the east coast, the logistics of accessing Meharry were a bit more complicated. For Don Burgher, Brian Manuel, Judy and I, there was the five and a half hour flight to Perth followed by a road trip of four days through the outback of W.A. We touched down at Meharry’s base on a glorious winter’s day in August. After an overnight camp at Dales Gorge in Karijini National Park we left Dales at 7.45am for the final 125 kilometre drive to Meharry. Despite what we had read about the difficulty of access once you leave the sealed Northern Highway, it was all pretty straightforward. If you stay alert the unsealed Packsaddle Road-Juno Downs has adequate signage to get you close to Meharry’s base. … After 4200 kilometres of driving the final leg into Mt Meharry is along an old mining exploration track, overgrown with spinifex… There were a few washouts to navigate and plenty of spinifex seeds to remove from the radiator as we pushed through the undergrowth; there were also lots of spiders, angry at being removed.” Source: Wild No 87. But times have changed. Now you can do all this in a 2WD. But if you are feeling lazy and are blessed with a high clearance 4WD having a bit of grunt, you can bump and grind your way all the way to Meharry’s summit. Cheaters. We didn’t, it wasn’t part of our deal. 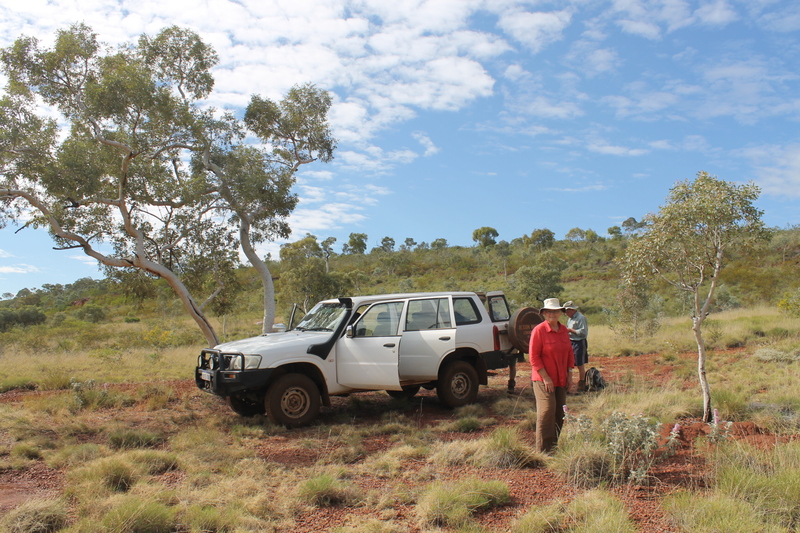 We parked our borrowed 4WD ( thanks Joseph Mania) at the first major jump-up, under the shade of a solitary snappy gum. Here we left Judy in charge of birds, bees and botany while Brian, Don and I headed off for the five kilometre walk to the summit, an altitude gain of only 427 metres. Parked under a shady snappy gum. Mount Meharry, at 1250 metres, is the highest point in Western Australia. It is named after William Thomas (Tom) Meharry (1912-1967), the states State’s Geodetic Surveyor from 1959 to 1967. 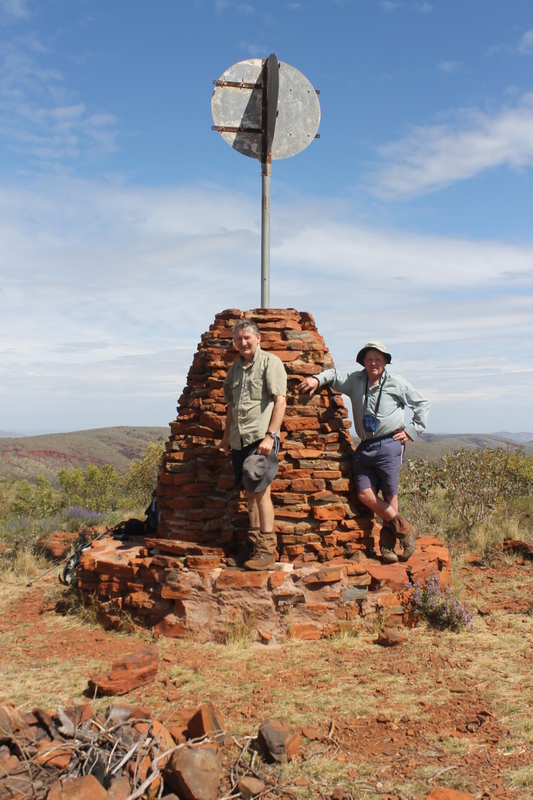 This survey cairn was constructed in September 2013 as a tribute to all surveyors who have explored and mapped the magnificent Western Australian outback. 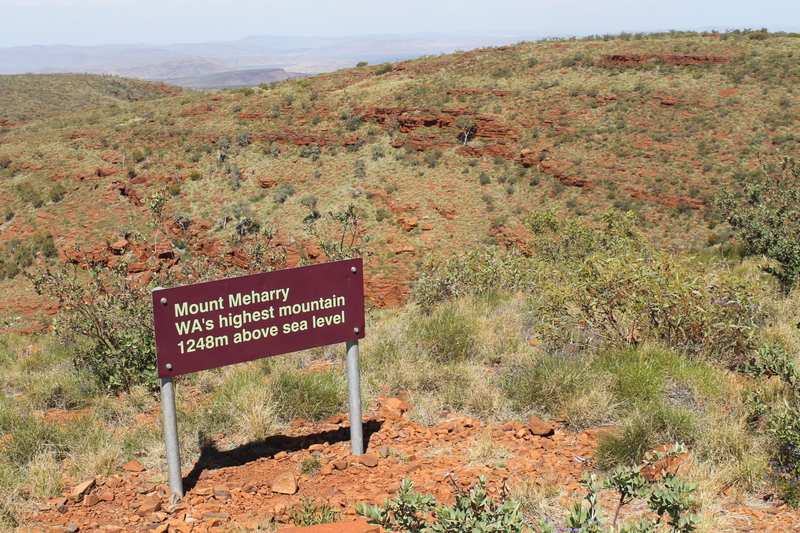 Geoscience Australia gives the height of Meharry as 1253 metres, not 1250 metres as per the plaque or the 1248 metres on the summit signpost. Confused? Enter Gina Rinehart, daughter of iron ore baron Lang Hancock. In 1999 she applied to the Geographical Names Committee to re-name Meharry to Mt Hancock after her prospector father. They declined but Australia’s wealthiest woman wasn’t so easily put off. In 2002 she went to the top and lobbied then Premier Geoff Gallop for the change. Fortunately, he too rejected the proposal. Features named by F. T. Gregory or related to his 1858 and 1861 expeditions. From the first jump-up it is an easy two kilometres before the track does any serious climbing. At this point the track winds up an open spinifex (Triodia spp.) covered ridgeline. 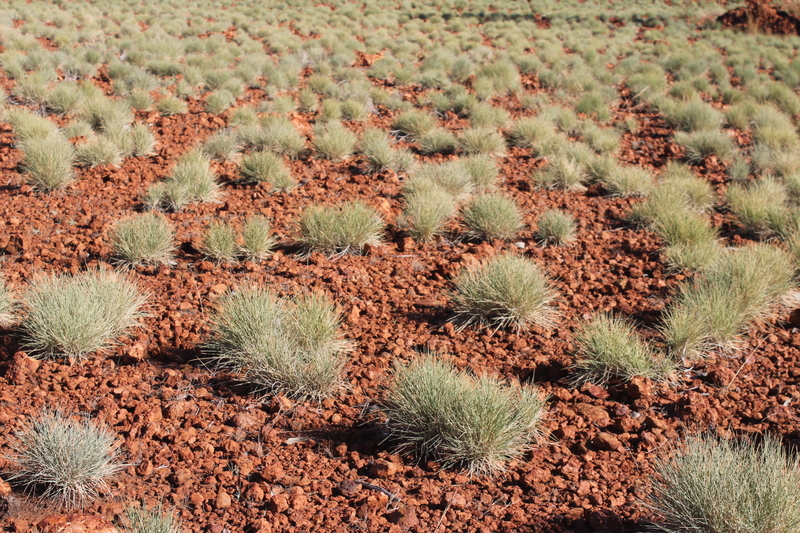 The spinifex was everywhere, easily the dominant ground cover: it grows in either doughnut shapes or hummocks Some species have long spiny leaves that dig into bare skin so it is a matter of self preservation to wear thick canvas gaiters when going off track. On warm days one of the common hummock species of spinifex (T. pungens) releases volatile oils, producing a very distinctive resinous scent. 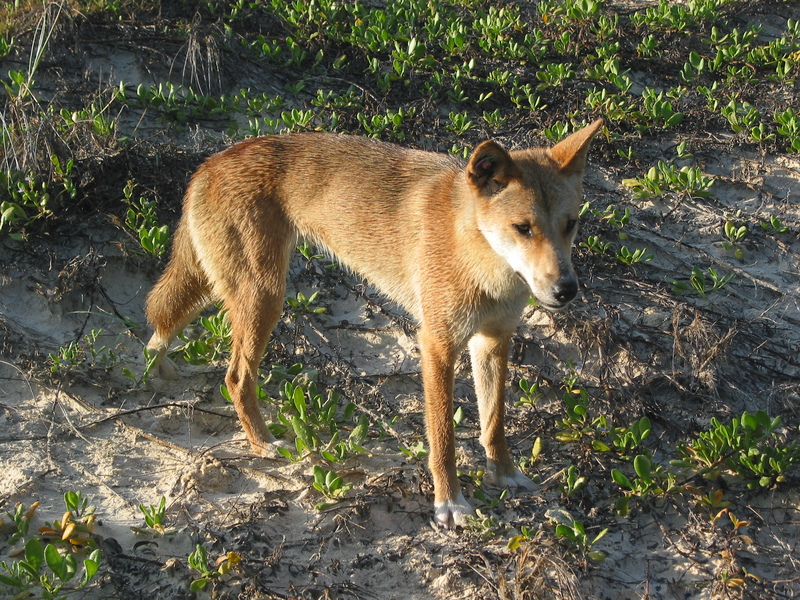 The resin from T. pungens (in the photo) was used by aboriginals as a glue to bind spear heads to their shafts. The resin is pliable when heated but sets rock hard. 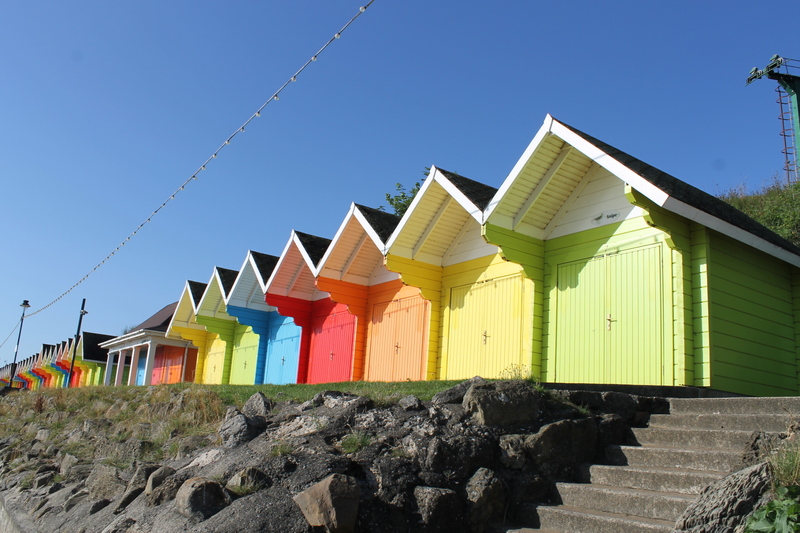 It was mid morning so the temperature was creeping up to its predicted 30°C, but tempered by a light west sou’wester. We pulled in for a water stop under the only shade, a stunted snappy gum (Eucalyptus leucophloia) located fortuitously at one of Brian’s infamous ‘uphill flat bits’. 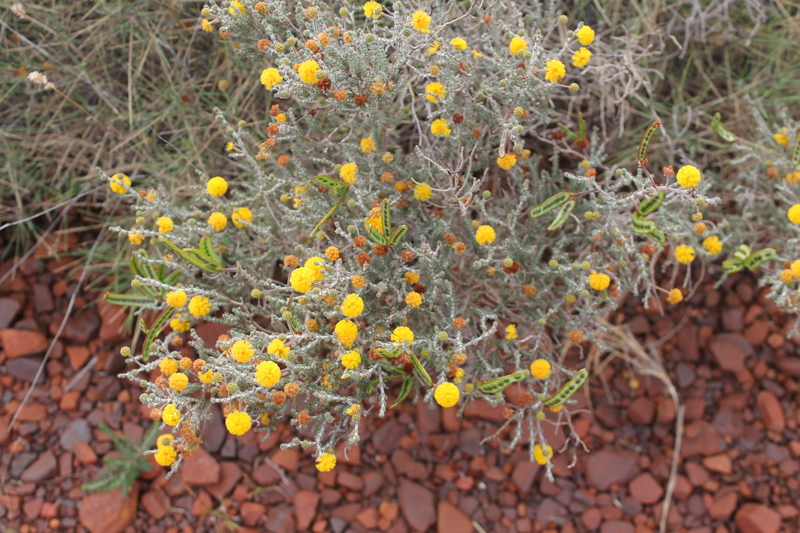 This attractive and robust little gum is a familiar sight on the rocky hills and plateaus of the Pilbara, typically growing to three or four metres. A defining characteristic is its white powdery bark, sometimes pocked with black dimples. Hence the species name leucophloia, meaning white bark. The only other tree we found on Meharry was the desert bloodwood (Corymbia deserticola). 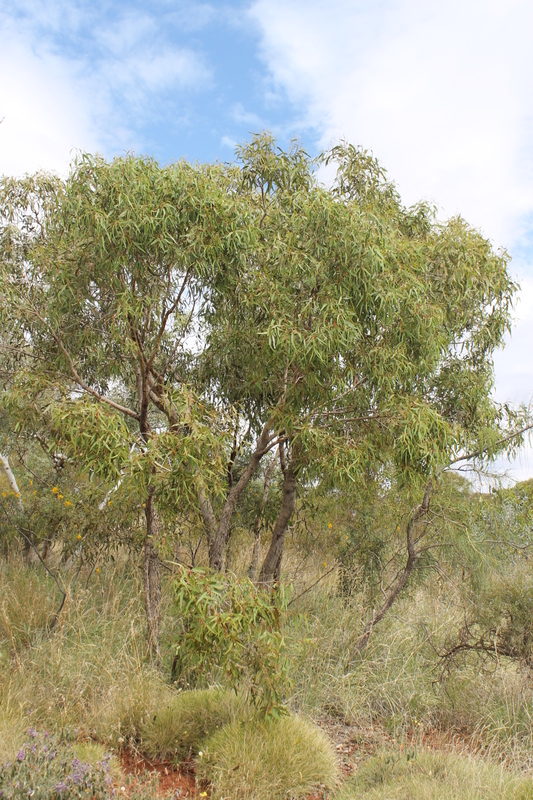 With its multi-stemmed mallee growth form and rough tessellated bark it is another very striking tree of the Pilbara and easily distinguishable from the snappy gum. Another two kilometres of plodding over loose scree took us to the crest of the ridge, a false summit. Meharry trig station was a further 800 metres on. 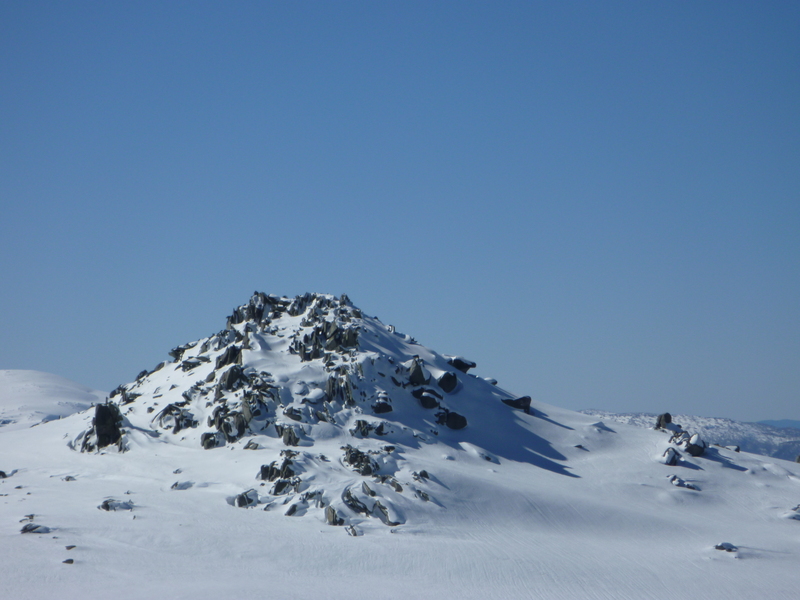 But there is no mistaking the real summit as it is marked by an elaborate rock cairn. We had left Judy and the 4WD some one hour forty five minutes earlier. Not too shabby a performance by three elderly bushwalking codgers. Brian & Glenn at Mt Meharry summit cairn. Don wielding the camera. The view from the summit revealed a spectacular landscape of red whale-back mountains, razor-back ridges and steep-sided gorges that make up the Hamersley Range, one of the oldest geologic surfaces on the earth. Karijini is the aboriginal name for the Hamersley Range. 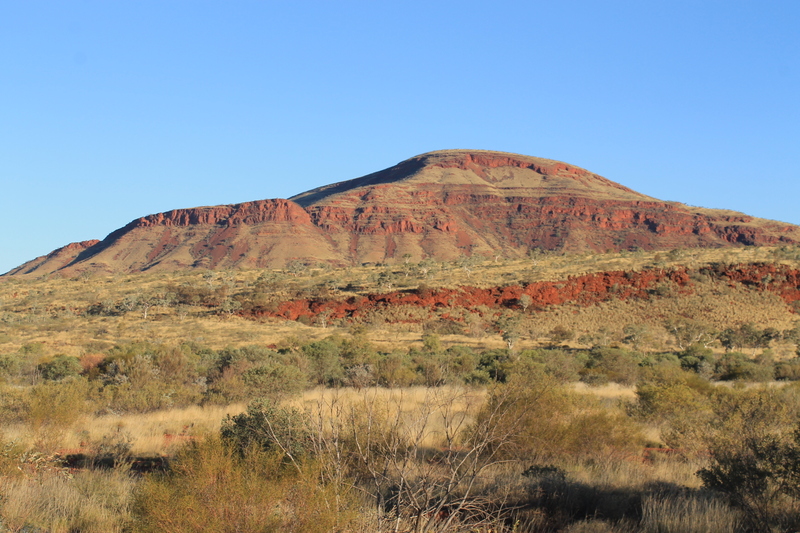 About 2,690 million years ago the Hamersley Basin began to fill with sediments forming the extensive deposits of banded ironstone formations (BIFs), cherts and metapelites collectively known to geologists as the Brockman Iron Formation. 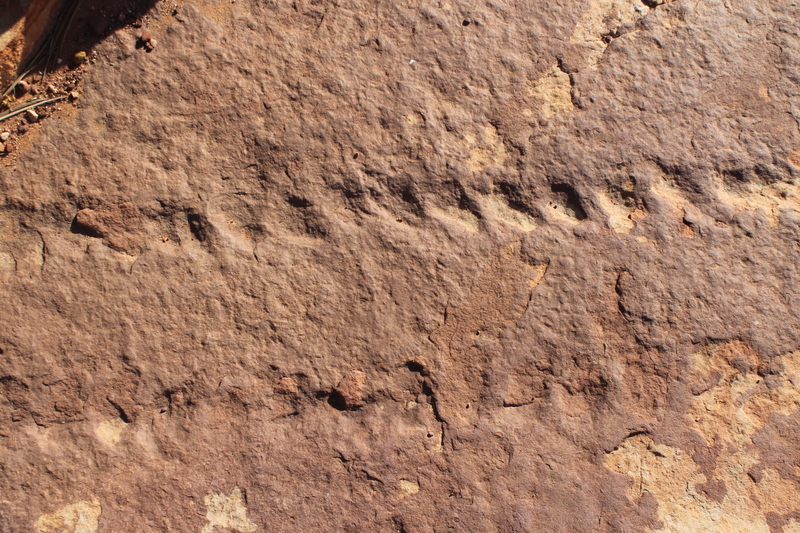 Mt Meharry is predominately an outcrop of this ancient Proterozoic banded ironstone. Typically it appears as a very hard brown rock composed of iron oxide and fine grained quartz. 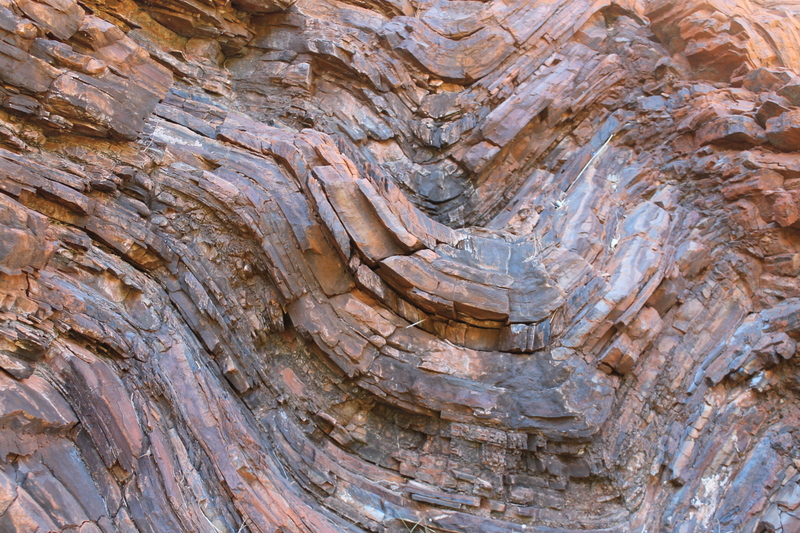 Similar iron rich rocks occur in South Africa and Brazil but the best exposures occur in Australia’s Pilbara. After the obligatory photos, a quick bite to eat and a good guzzle of water we turned tail and headed downhill, back to the 4WD and Judy who was busy dealing with the unwanted attentions of ‘sweat bees’. Sweat bees is a generic term for a range of these inconspicuous little fellows (eg.Family:Halicitdae) who are attracted to perspiration, specifically the salts in sweat and as Judy discovered, can be quite a nuisance, just like Australia’s notorious bush flies. And what of Judy’s birding and botanizing? Well, the avians weren’t co-operating. Hardly surprising. We were, after all, in a desert, with no nearby surface water and the ocean five hundred kilometres to the west. 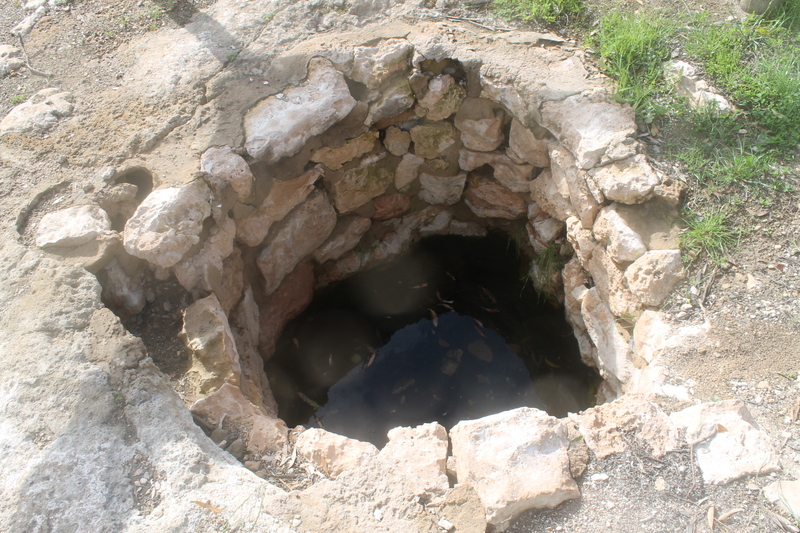 The semi-arid tropical climate has a highly variable rainfall of only 250mm to 300mm per annum; the evaporation rate is twelve times greater, hence the minimal surface water. The presence of surface water is very much dependent on incursions of the summer cyclonic rains sweeping in from the Indian Ocean to the west. Back in bird land the meager offerings were a Black-faced Cuckoo-shrike, a Yellow-throated Miner and the seemingly ubiquitous Galah. However the abundance and showiness of plant life in the Australian outback is often exceptional, especially after rain. Pink Royal mulla-mulla (Ptilotus rotundifolius) covered the rocky Meharry landscape, occupying the interstices between clumps of spinifex. 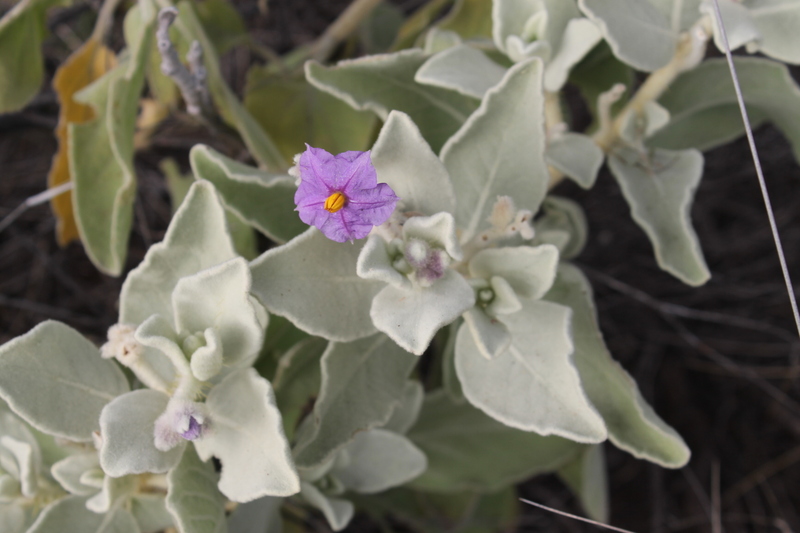 Royal mulla-mulla is a low perennial shrub growing to about one metre tall. The flower spikes are unmistakable: long, cylindrical and a bright pink. More than 35 species of mulla-mulla grow in the Pilbara and make for spectacular displays after good summer rains. 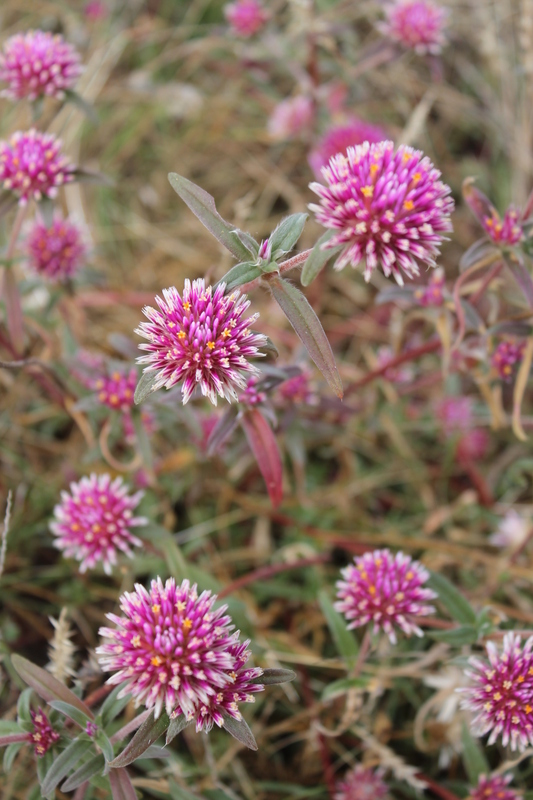 Other ground covers included the purple-flowering Flannel Bush (Solanum lasiophyllum), and the delicate blue pincushion flowers of the Native Cornflower (Brunonia australis). Brunonia australis is the sole species in the genus Brunonia which is the only genus in the endemic family Brunoniaceae. It is named after Robert Brown, naturalist on Matthew Flinders’ Investigator. 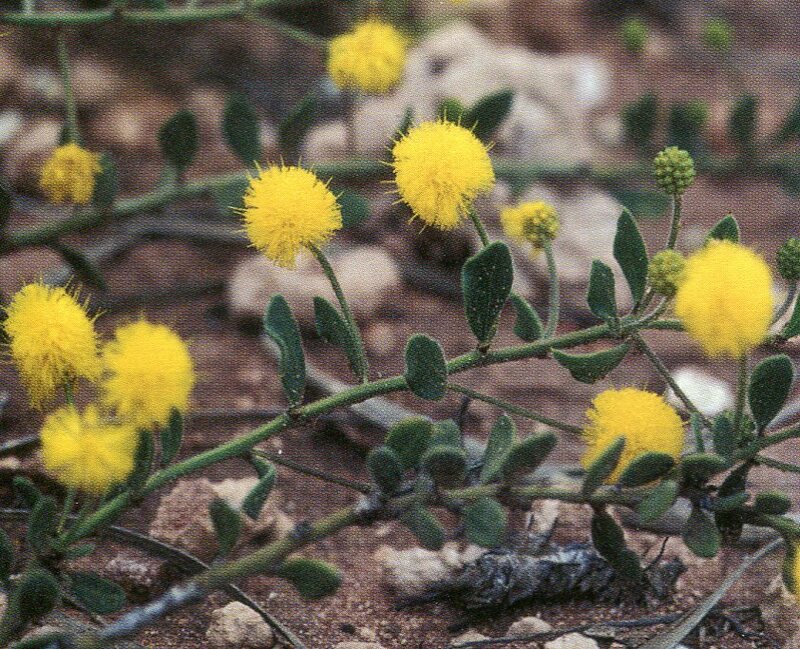 Wattles and sennas dominated the Meharry shrub layer and included the golden-flowering Gregory’s Wattle (Acacia gregorii). This dense spreading shrub grows to only half a metre and has golden ball-like flower heads. The name commemorates Francis Thomas Gregory whose 1861 expedition passed through the Pilbara. 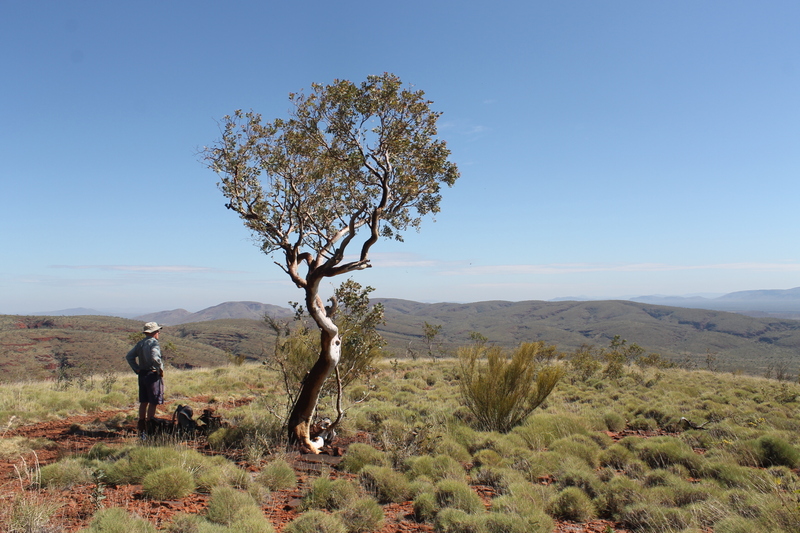 Another wattle found here was Acacia hamersleyensis, the Hamersley Range Wattle. This multi-stemmed wattle grows to about four metres and features bright golden dense cylindrical spikes. Thomas Francis Gregory: The North-West Australian Exploring Expedition. 1861. 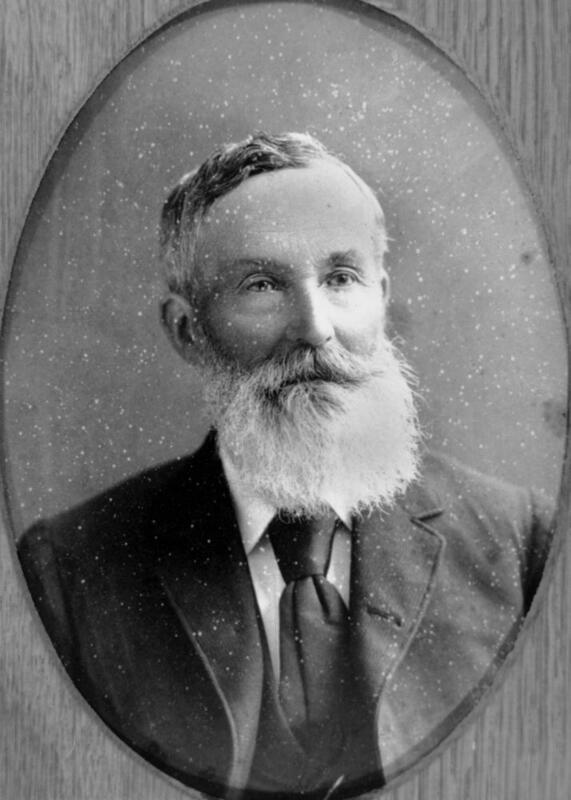 Thomas Gregory was the brother of the outstanding Australian explorer and bushman, Augustus Gregory. Their 1858 expedition to the Gascoyne River had attracted the attention of English capitalists interested in cotton ventures. The Home Office and Royal Geographical Society proposed a new colony on WA’s north-west coast with the special objective of cultivating cotton. Thus F.T. Gregory was contracted by Captain Rowe, Surveyor General of WA to head a scaled back expedition prior to setting up a full colony. On the 23rd of April,1861 Gregory departed on the barque Dolphin with a party of nine, ten horses and supplies of flour, salted pork, dried beef preserved meat, bacon, sugar etc. Enough grub for eight months. If the desert , horses or aborigines didn’t do you in then it was a fair bet that the diet would. 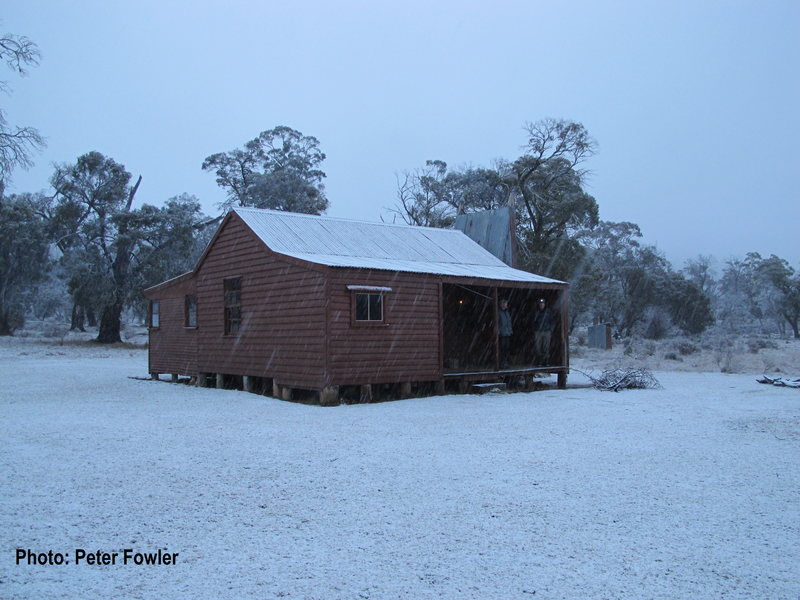 And so, for well over a century, Mt Bruce was thought to be WA’s highest mountain. His journal also mentions Mt Augustus which he had named on his 1858 expedition into the Gascoyne River District after his brother Augustus Gregory. It was from Mt Augustus that he first saw Mt Bruce. But that is a story which I will keep for another time. Mt Bruce ( Bunurrunna): 1236metres. Mt Turner: J. Turner was second in command of the expedition. Mt Brockman: E. Brockman was a member of the expedition. Hamersley Range: Hamersley was one of the expedition’s backers. Fortescue River: Fortescue was the British Under-secretary for colonies. Dolphin Island: from their supply vessel Dolphin. Ashburton River: President of the British Royal Geographical Society. Capricorn Range: presumably because it straddles the Tropic of Capricorn. 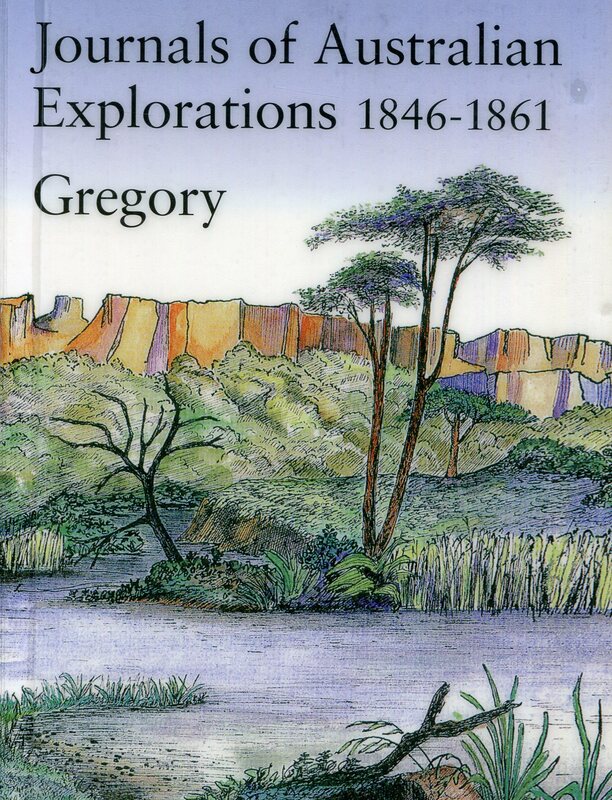 Readers interested in the expedition journals of the Gregory brothers should acquaint themselves with an excellent facsimile edition published in 2002 by Western Australia’s Hesperian Press. 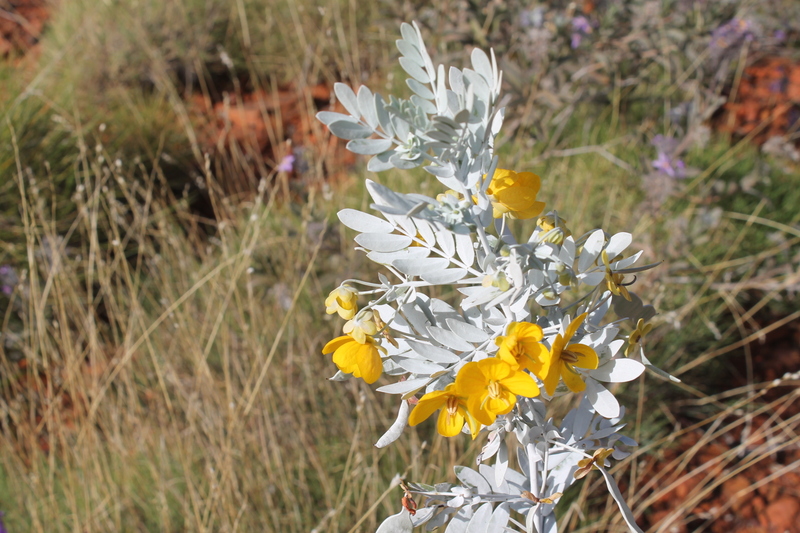 Photo Gallery: Plants of the Pilbara. 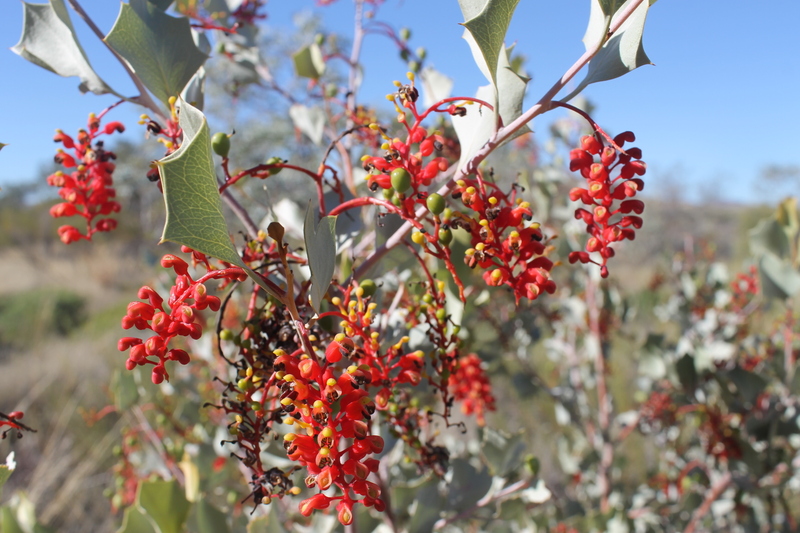 Holly Grevillea. G. wickhamii. Named after John Wickham. Captain of the Beagle who collected this plant with Charles Darwin during surveys of the north-west coast 1837-1838. 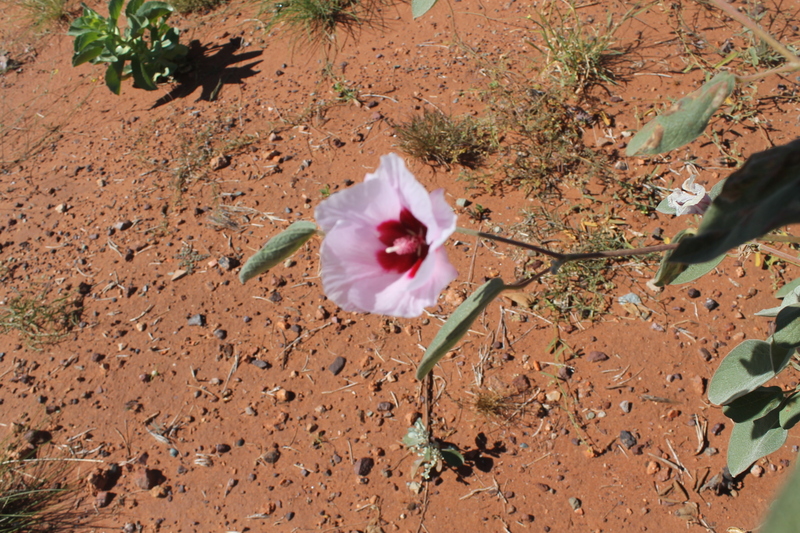 Australian Desert Rose: Gossypium australe. 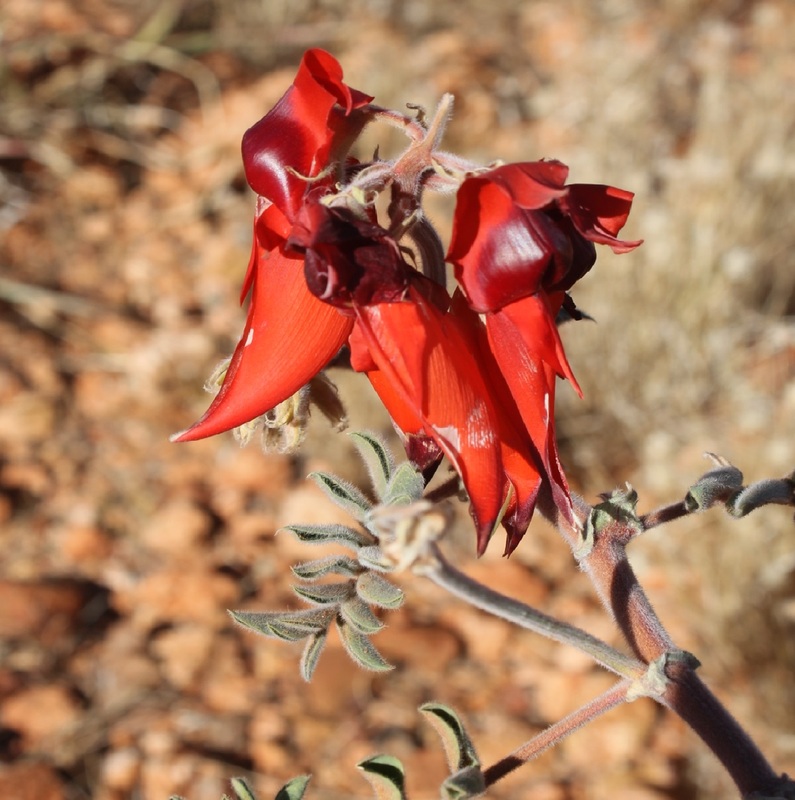 Sturt’s Desert Pea: Swainsona formosa. Its name honours the explorer Charles Sturt but was first collected by Willim Dampier in 1699 on an island on the Dampier Archipelago. Common Rock Fig: Ficus brachypoda. 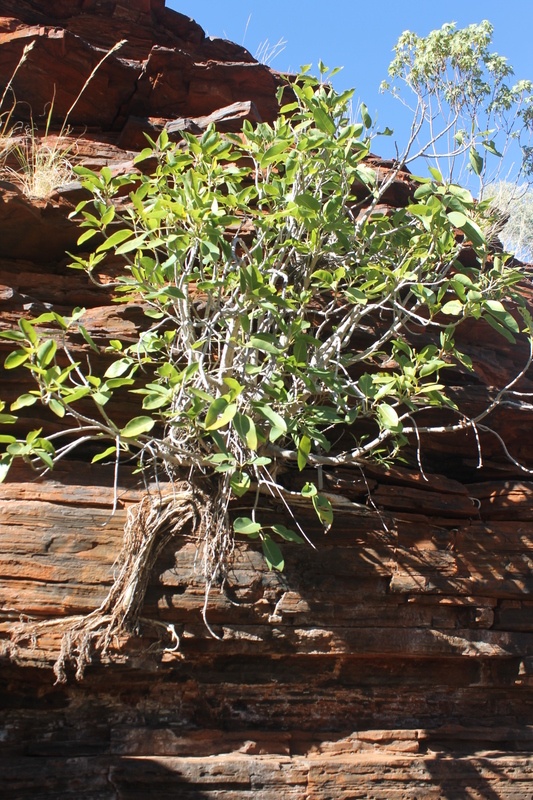 Found growing in cooler moist gorges of the Pilbara. Often clings precariously to ledges and cliff faces. Grey Whorled Wattle: Acacia adoxa. 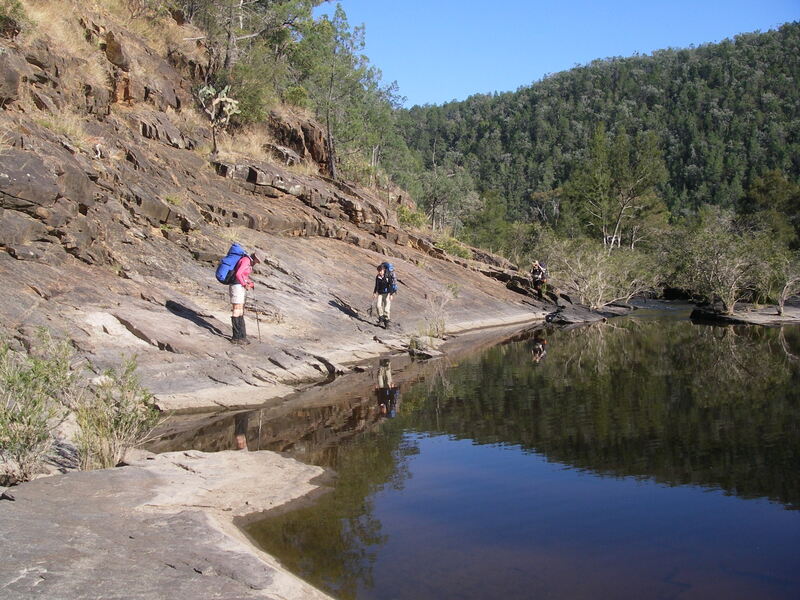 After reading this account you will have realised that Mt Meharry is no great challenge. For me, its interest lies in the opportunity to traverse an arid zone mountain landscape, a walk of outstanding scenic beauty as well as exceptional geologic and botanical interest. And as a bonus you can bag Western Australia’s highest mountain, a remote peak in outback Australia. Mission accomplished. 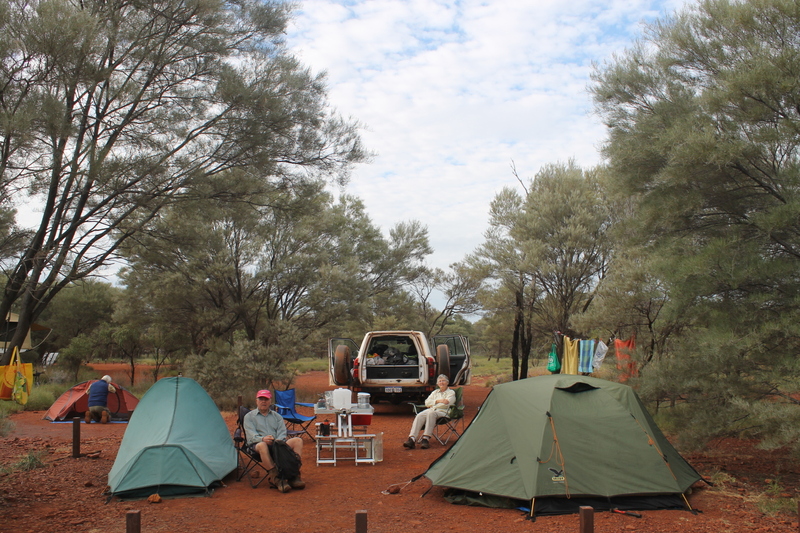 Then it was back to the comfort of our camp site at Dales Gorge, under the welcome shade of a grove of Mulga trees. A Job Well Done: resting back at Dales Gorge Campground, Karijini National Park. Bush Books series published by WA’s Dept of Conservation and Land management. These are pocket sized field books: Common Plants of the Pilbara, Wattles of the Pilbara, Geology and Landforms of the Pilbara. A.C. and F.T. Gregory Journals of Australian Explorations 1846-1861 ( Hesperian Press 2002). First published by J.C. Beal Government Printer, Brisbane 1884. S. Mitchell Exploring WA’s Natural Wonders ( Dept of Environment & Conservation). 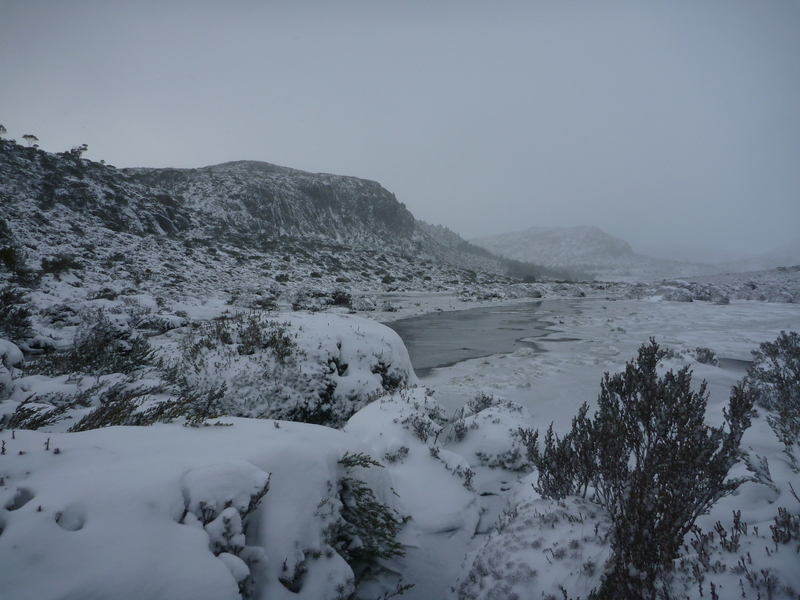 Previous PostThe Walls Of Jerusalem: A Wilderness in Winter.Next PostPaddling Australia’s mighty Murray River.